Sangoma Technologies Corporation (TSXV: STC) (http://www.sangoma.com), a leading provider of connectivity hardware and software products for WANs and Internet infrastructure, announces that its family of AFT (Advanced Flexible Telecommunication) T1/E1/J1 voice/data cards are now customized to work with Asterisk, the free Linux PBX software that is revolutionizing telecommunications on VoIP and conventional telephone networks. Capable of handling both voice and data and supporting all popular open source projects including Asterisk, YATE, SIPxchange, OpenPBX and others, the A101, A102 and A104 offer a new market standard for performance, reliability, compatibility, support and ease of installation. With less demand on the host CPU, Sangoma's WANPIPEÂ® drivers take advantage of the AFT technology to substantially reduce the processing required to handle TDM voice calls. This reduces the CPU's workload and results in fewer dropped calls, less jitter and better voice quality for callers. "In all companies of any size, telephone connections are at least as vital as the electricity supply," says Sangoma Technologies President and CEO David Mandelstam. "For soft PBX technology to succeed, reliability and perfect voice quality have to be a given, even before a user can begin to enjoy the powerful and customizable features this technology offers. Our role in this enterprise is to provide the quality in TDM interfaces that allow the soft PBX and VoIP community to realize the potential of all their hard work and imagination." "Sangoma's family of AFT voice/data cards enables it to offer a new price/performance standard that the competition cannot match," says Halo Kwadrat's Vice-President Michal Bielicki - Sangoma's distributor in Europe. "With Sangoma, we expect to both dominate and expand the integrated T1/E1/J1 connectivity marketplace based on their quality and unparalleled technology." "The true promise of AFT technology lies in our ability to field upgrade not only the device driver code, but the card's FPGA firmware as we improve our TDM voice support," adds Mandelstam. "Projects already under way include hardware level PRI support and true time-slice channelization on-board. These improvements plus others related to echo and codec manipulation can be retrofitted to existing AFT hardware as they become available." Â· Compatible and Flexible -- Sangoma's voice/data cards are self-sensing for 3.3v and 5v PCI slots and software configurable for T1, E1 or J1. They share interrupts properly between themselves and other PCI compatible devices, supporting unlimited numbers of cards per PC chassis. The AFT series cards all conform to the 2U form factor, both in height and length, allowing users to install many cards in a slimline 2U chassis so as to maximize server capacity. Â· Rock Solid Data Modes -- In mixed voice/data installations, the data streams are separated out in hardware and handled completely independently of the voice channels by Sangoma's standard WANPIPEÂ® data handlers that have been carrying IP traffic for many years. Only the voice-related traffic gets diverted to the Asterisk system. The result is a system that is totally reliable, fast and well managed, while the CPU load is drastically reduced. Â· Certification -- Certification compliance is critical to every Sangoma customer. All Sangoma voice/data cards have undergone CE, FCC part 15 and FCC Part 68 certification, and every board is properly marked. Â· Sangoma Trust and Quality -- As part of its commitment to quality assurance, each Sangoma card is individually inspected and burned-in prior to shipment in protective anti-static wrap complete with cables, manuals and CDs. The result is a very low dead-on-arrival rate and high reliability in service. About Sangoma Technologies Corporation Founded in 1984, Sangoma develops and manufactures wide area network (WAN) communication hardware and software products, with an emphasis on the PC platform. The communications solutions, voice, data and video gateways support all popular WAN networks, line protocols and all standard PC operating systems and platforms including Linux, Windows, FreeBSD, Sun Solaris, NetWare and DOS. Sangoma Technologies Corporation is publicly traded on the TSX Venture Exchange (TSXV: STC - News). GL Conveys Echo, Delay and Voice Quality Analysis of Voice Calls in VoIP, TDM, 2-Wire, and Mobile Networks. GL Communications Inc. a leader in providing PC-based test, analysis and simulation products and consulting services to the worldwide telecommunications industry, conveyed today the availability of its software solution for Echo, Delay and Voice Quality Analysis of Voice Calls in VoIP, TDM, 2-Wire and Mobile Networks. Speaking to media persons, Mr. Vijay Kulkarni CEO of the company said, GL's Echo Measurement Utility (EMU) software is an offline adjunct analysis application (under control of VQuad) that compares the source and received files to determine echoes and delay of echoes. EMU software assesses sidetone, line, and acoustic echo and the corresponding delays. He added, GLs EMU Software measures Echo Path Delay (EPD) and Echo Return Loss (ERL) of voice calls. Echo can be as simple as sidetone, or more complex such as line, and acoustic echo. The EMU when combined with GL's VQuad, Dual UTA, T1/E1 Analyzers, RTP Toolbox, WEBViewer. or Voiceband Analyzer, additional voice quality metrics such as round trip delay (RTD), voice quality, and noise can also be measured. Mr. Kulkarni further added, To provide a comprehensive assessment of voice quality irrespective of network type, GL has combined various tools together into one platform consisting of VQuad, Dual UTA, USB T1 E1, and WEBViewer. 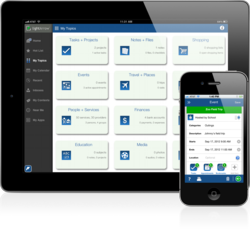 This platform provides the ability to make VoIP, TDM, and Mobile calls from any fixed or mobile location. All interface flexibility is provided (2Wire, 4Wire, VoIP, TDM, and Mobile) within the Dual UTA and USB T1 E1 Analyzers. In addition, VQuad provides algorithms for signaling, voice transmission, and voice quality assessment. WEBViewer provides the central point where voice metrics are stored and displayed through a WEB interface. Powerpay is an app by AppCharge that turns any Apple iPhone, iPad, iPod Touch and most Android devices into a payment terminal giving merchants the ability to accept credit cards virtually anywhere. Ideal for business on the go, AppCharge features an optional card reader and a touchpad for customer signatures. It also e-mails electronic receipts and allows merchants to keep an electronic inventory of their receipts making paper receipts a thing of the past. As businesses move towards a more digital and mobile world, AppCharge is an affordable solution to mobile payment processing. Its available now on the iTunes App Store and Google Play. For more information, go to http://www.powerpay.biz/goappcharge. Acoustic Technology Inc. (ATI Systems) of East Boston, MA is pleased to announce its mass notification system was successfully installed at the United States Military Academy at West Point for a comprehensive mass notification solution. The system will assist and alert personnel in the event of an emergency and allow leadership to rapidly communicate critical response information. The United States Military Academy at West Point is a major military icon. The United States Military Academy has been educating, training, and inspiring leaders of character for United States Army and for the nation for more than 200 years. With 600 admin staff and approximately 5,000 undergraduates, the academy sits on scenic high ground overlooking the Hudson River, 50 miles (80 km) north of New York City. The entire central campus is a national landmark and home to scores of historic sites, buildings and monuments. ATI Systems was awarded the contract to install a complete turn-key notification system capable to provide real-time emergency and essential information through a Giant Voice (GV) alert systems to personnel located on the West Point, United States Military Academy. The system consists of 11 High Powered Speaker Stations (HPSS16), 2 Outdoor Speaker Units (OSU) and controlled by 3 Central Control Stations (CCU). The installed system has excellent intelligibility of speech and voice clarity, natural sounding and free of distortion so that personnel easily understand information and directions. The GV system is activated via wireless radio frequency. 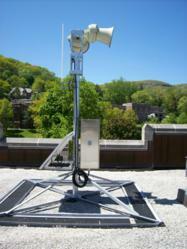 The GV system speakers were installed on freestanding poles and on existing buildings. The speakers are weather resistant and can operate in all environmental conditions consistent with the geographical areas of West Point, NY. The central control stations are used for activating, controlling and monitoring the entire system. The control stations provide an interface to allow a typical CD to connect to control station using an audio jack to allow the user to play external music using a CD player, MP3 player or connect to a computers audio output to play .wav files. The control stations are fully integrated with the existing DesktopAlert software. The integration with the DesktopAlert system allows the operator to send emergency notification messages to network computers in addition to activating the ATI system from any computer on the school network. NeoSpeech, a leader in text-to-speech (TTS) software and speech-enabled solutions, announced today that NTT Docomo, a major Japanese voice services carrier uses NeoSpeech VoiceText software for their own Siri-like voice activated concierge solution, Shabette Concier, for Android Smartphones. Shabette Concier lets you use your voice to send messages, schedule meetings, place phone calls, and more, similar to Apples iPhone Siri application. Shabette Concier, however, also responds to questions and provides answers by using leading content providers such as Wikipedia. NTT Docomo spokesperson described their new app as an advanced voice-activated user interface that enables customers to intuitively and directly operate services and smartphone features with voice commands. Shabette Concier is currently available in Japanese and available for Android smartphones version 2.2 and higher. VoiceText is computer software for use in speech recognition, speech synthesis, speaker verification, and voice morphing; computer game software and educational software in the field of speech recognition, speech synthesis, speaker verification, and voice morphing. Everest Group has assembled a group of 14 large enterprise IT leaders, service providers, and vendors to discuss a topic of growing urgency throughout the cloud computing industry: How do Fortune 1000 companies prepare for the cultural, social and career development issues that can scuttle the best-laid technical plans for moving from traditional enterprise IT to cloud computing? The group will gather at the CloudConnect event February 13-16 in Santa Clara, Calif. In addition, notable cloud thinkers such as Simon Wardley of CSCs Leading Edge Forum, David Linthicum of Blue Mountain Labs, Clayton Pippenger of Quest Technologies, John Lake of Panasas, and Francesco Paola of Cloudscaling will offer insights from their work with multiple large enterprise and service provider clients. Public cloud services like Amazon Web Services, Rackspace and Microsoft Azure have seen rapid growth in the past two years, adding services that make these early leaders more and more attractive to enterprise IT departments. As a consequence, CIOs and IT department leaders have become more comfortable with the technical and engineering challenges of cloud migration. The next hurdles to overcome for many of these organizations, however, are cultural. Todays enterprise IT org charts were designed when client/server architectures were the norm. Cloud services, however, require fundamental shifts in technical skills, internal customer relations, pricing and evaluation criteria to achieve the benefits cloud promises. How to keep legacy cultures from eating your next-generation strategy. Why flexible governance models will become the norm in cloud IT. Grief counseling for the CIO: What can the executive team do to support IT leadership as the transformation to cloud unfolds? Where to find and how to cultivate the cloud computing skills your IT function must have to be successful. These enterprises, vendors and service providers offer an incredible diversity of cloud migration experiences, said Scott Bils, who chairs the track and is also the Partner at Everest Group who leads the firms Next-Generation IT practice. Anyone who wants to learn more about the challenges of moving to cloud from an organizational and cultural standpoint wont find a better opportunity to learn than from these folks. CloudConnect has always had a strong representation throughout the technical community, said Steve Wylie, general manager of CloudConnect. But the large enterprises weve gathered for the Organizational Readiness track will give our attendees interested in organizational and business implications of cloud a new and compelling reason to attend. CloudConnect, produced by UBM TechWeb, is the defining event of the cloud computing industry. As both a conference and an exhibition, CloudConnect's goal is to chart the course of cloud computing's development by bringing together enterprise IT professionals, developers, infrastructure and service providers and cloud computing innovators. UBM TechWeb has produced cloud events that define and frame cloud computing discussions since June 2008, and recently expanded the CloudConnect event brand to Chicago and Bangalore, India, in addition to the flagship Santa Clara event. CloudConnect is a one-of-a-kind event that encompasses the entire cloud computing ecosystem featuring a Launch Pad program, IT & Developer workshops and a full conference program. For more information visit: http://www.cloudconnectevent.com. Everest Group is an advisor to business leaders on the next generation of global services with a worldwide reputation for helping Global 1000 firms dramatically improve their performance by optimizing their back- and middle-office business services. With a fact-based approach driving outcomes, Everest Group counsels organizations with complex challenges related to the use and delivery of global services in their pursuits to balance short-term needs with long-term goals. Through its practical consulting, original research and industry resource services, Everest Group helps clients maximize value from delivery strategies, talent and sourcing models, technologies and management approaches. Established in 1991, Everest Group serves users of global services, providers of services, country organizations and private equity firms, in six continents across all industry categories. For more information, please visit http://www.everestgrp.com and research.everestgrp.com. For more information about Everest Group and its consulting and research capabilities, please visit http://www.everestgrp.com, email info(at)everestgrp(dot)com or call +1-214-451-3000. GemaTech has developed the technology to enable any organisation or individual to voice record any phone call made from a smartphone or triggered via a web-enabled device, which is digitally recorded, stored and replayed via GemaTech’s highly secure and resilient data storage network and super fast search and retrieval portal. Users of GemaTech’s smartphone voice recording solution can also benefit from lower calling charges as it uses traditional PSTN (Public Switched Telephone Network) to deliver the calls. For years organisations have realised the benefits of voice recording landline phone calls, especially in helping to resolve disputes with customers and suppliers quickly, which itself helps to minimise damage to brand and reputation. But until now the technology has been limited in its ability to voice record phone calls made from mobile devices both securely and reliably. Since March 2009 financially regulated organisations have had to record and store all telephone conversations and electronic communications relating to client orders and the conclusion of transactions in the equity, bond, and derivatives markets as required and regulated by the FSA (Financial Services Authority) in the UK. Voice recording phone calls is also the best way to identify market abuse and to increase visibility of financial transactions and processes. The FSA is expected to make an announcement shortly on the current mobile recording exemption included in the 2009 regulations. GemaTech have also partnered with Voxsmart, official BlackBerry Alliance members, to provide a fully managed cloud-based specialist voice recording solution for BlackBerry smartphones. Both the GemaTech smartphone and BlackBerry solutions enable GemaTech to provide a hosted mobile voice recording solution to the vast majority of the corporate mobile phone market. Virtual reality with voice conferencing? This is it !!! travelerville.com ….It’s a FREE service. Virtual reality with voice conferencing? This is it !!! travelerville.com ....It's a FREE service. Our unique server provides 3D virtual worlds and full duplex voice audio conferencing. Each person is presented by an avatar, which is a head of a human, object, or an animal. Most of the avatars have unique expressive behaviors built in. Users create a screen name to use when they are on the server. We schedule events for birthdays, some holidays, and other interactive events. We cater to all ages and moderate the public spaces, so all users have a enjoyable time. Users can also create "locked" spaces for private get-togethers. The client program can be downloaded from our site and the server will handle connections from 28.8K to broadband speeds. Minimum system requirements are a Pentium 100 Mhz cpu or higher, Windows 95, a microphone and speakers, or combo stereo headset/microphone. Voice quality is very clear and we get visitors from all over the world. So, come on in and visit us, bring your friends, or meet new people. Bringing the world together in our world...the Travelerville server.